Last night I ditched my responsibilities at home to enjoy a rare night out by myself, on a weeknight no less! I got to attend a special event: the local movie premiere of Boston: An American Running Story! The film opened to rave reviews from runners everywhere, and I happily add my favorable review to the pile. The movie offers everything you would want from a film about the iconic Boston Marathon — facts about the history of the race, old film footage of the race and past interviews with the winners, and current interviews with those most intimately involved in the race. It sounds terribly cliché but I laughed, I cried, and I felt inspired. I highly recommend the movie for runners everywhere — those who want to run Boston, those who have run Boston, and those who just want to enjoy a great film about the history of running. I think the people of Boston would love the film too; it’s a real tribute to all the people involved in putting on the race and all the supporters who come out to line the race course each year. I ran the race in 2016 and that’s what I remember most — the unparalleled support I felt from the crowd from the starting line to the finish. This film highlights the 2014 race, a triumphant return of the event after the 2013 Boston Marathon bombings. It certainly was difficult to watch the footage of the bombings, but the film treated it in just the right way — not giving any attention to the perpetrators but rather focusing on the victims and the heroes of the day. This is a film I know I’ll want to watch over and over again, adding it to Spirit of the Marathon as one of the films I will watch for inspiration before I run another marathon. Did you see the film, or will you watch it when it becomes available near you? Have you been following the news? I don’t mean the ISIS crisis or whether Scotland will vote for independence. I mean The Boston Marathon registration news. Registration for qualifiers has closed…. Due to the amount of submissions received during this period from all time qualifiers, registration will remain closed and will not reopen on a later date. All of these individuals who submitted an application for entry will receive notification by the middle of next week. That means that the BAA received at least 8,000 applications in this final week of registration and it is possible that some qualifiers will not get in. Last year the cutoff was qualifying time minus one minute 38 seconds. It is hard to make predictions for this year because of the exceptionally high interest last year and the larger overall field that year, but it is clear that my -0:34 is cutting it extremely close either way. I have a slight bit of hope that the BAA will be generous and end up letting everyone in (in light of the success of the race last year with an even larger field). Really there is no use in speculating. I just need to keep my fingers and toes crossed and I’ll know for sure by Wednesday, September 24! 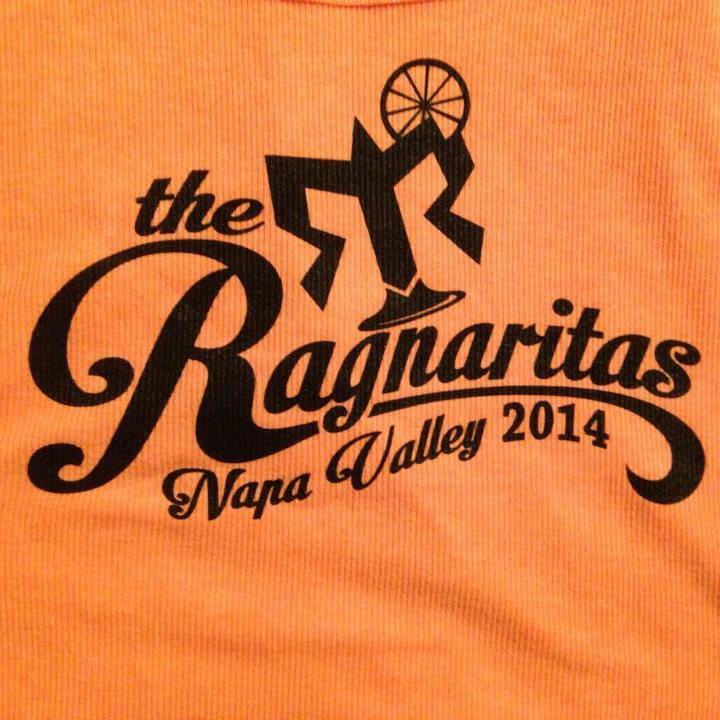 In the meantime I’m distracting myself with a little 200-mile relay race this weekend with the Ragnaritas! Design by teammate Sara Aroz and photo stolen from teammate Renee Christensen! This morning I submitted my application for acceptance into the 2015 Boston Marathon. Approximately 16,000 application submissions from the fastest among all qualifiers were submitted during the first week of registration (September 8-13). At the conclusion of the next phase of registration, the B.A.A. will accept up to 8,000 additional qualifiers. Now the waiting begins. The email confirmation of my application stated that acceptances for this latest group of entries will be sent out in October, although I suspect we might hear sooner than that. I think chances are good that all of us “squeakers” will get accepted, but I’m not considering it a done deal by any means. In the meantime I am taking time to celebrate my marathon finish time, 3:44:26, whether or not it is fast enough to get me accepted into the 2015 Boston Marathon. I realized that in my stupor in the days after the race I didn’t even acknowledge the fact that 3:44:26 is a personal record for me by 8 minutes and 16 seconds! That is pretty significant, even if it only boils down to 18-19 seconds faster per mile over the 26.2 miles. For someone like me who did not start running until she was staring down 40 years of age, and was 4 days shy of 43 years of age on race day, it’s a big deal to run 26.2 miles at 7 miles per hour. Even now, after having gone the distance at that pace, I can hardly even imagine setting the treadmill for 7.0 and running for 3 hours and 44 minutes and change. You know, the other day I was talking to a friend who is training for his first full marathon coming up this October in Long Beach. He said he finally understood the appeal of marathon running: the amazing sense of satisfaction you can achieve by challenging yourself to do something you couldn’t have done a year ago or even a month ago. It’s definitely worth celebrating. When 9/11 happened, I watched the news from my 15th floor apartment in Cambridge, looking out over the Charles River to Boston. 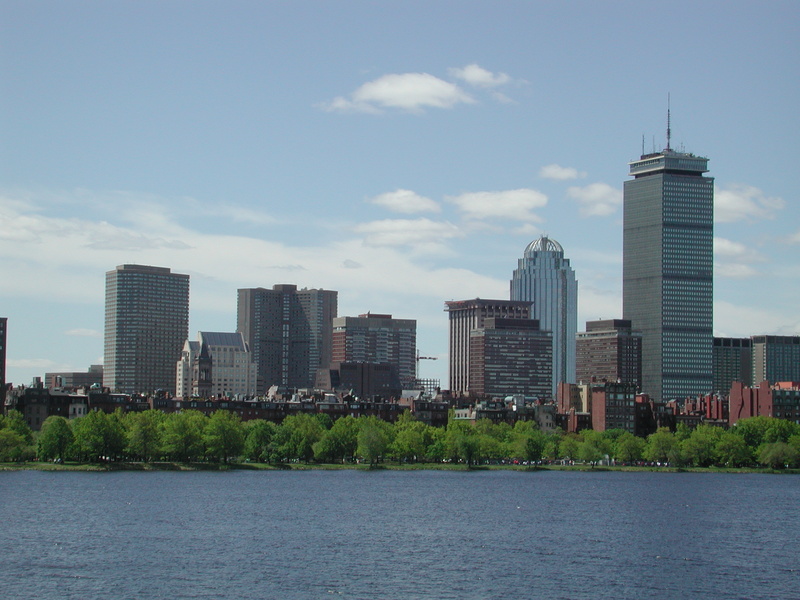 The 2002 view of Boston from my apartment side of the Charles River. Two months pregnant with my first child, I remember feeling vulnerable at being in another large American city, and wondering what kind of world I was bringing a child into. Fast forward seven more months to April 2002. 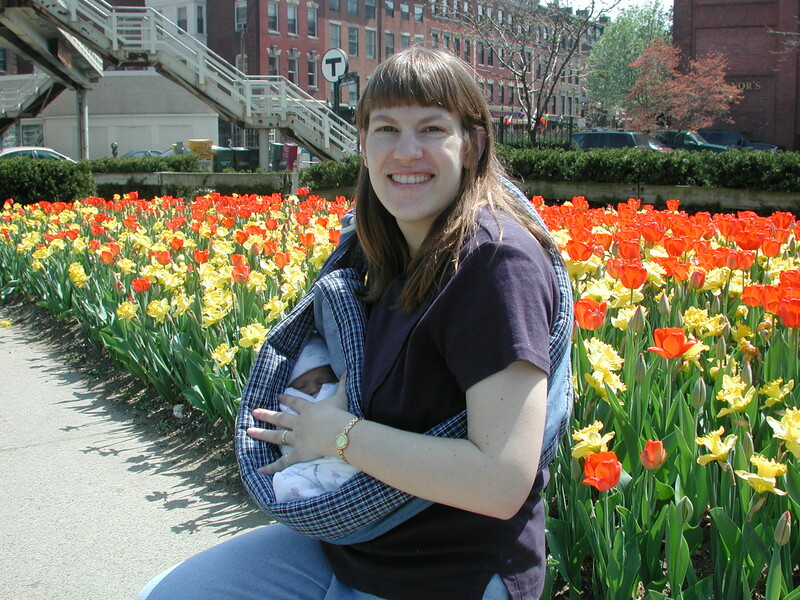 As my husband and I drove our newborn baby girl home from the hospital through the streets of Boston, we had to follow a detour back to our apartment because some sort of race was going on that day. I wasn’t a runner back then; I didn’t appreciate that that marathon was THE Boston Marathon. Fast forward 11 years to April 2013. From the safety of Southern California I watched the news yesterday of the bombings in Boston, my heart breaking for the people there and for the community of runners everywhere. I’ve come a long way since 2002, and now I am a runner. I ran a marathon in 4:02 and I work toward the ambitious goal of 3:45 to qualify for Boston. I know how hard all those Boston marathon runners trained to get there. It saddens me to see the loss of the life, the injuries, the distress of all those affected. And yes, it saddens me to think that those who finished the race, and were not injured, had their race experience tainted by tragedy. It saddens me to think that some 5,742 runners did not get to finish the race. 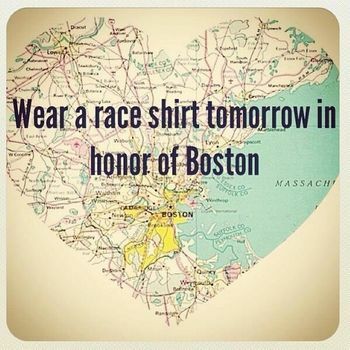 So today I will wear a race shirt in honor of Boston.